Full disclosure: I reported for Journal Register Company newspaper the Daily Freeman from June 2004 to October 2005. At first glance, today’s Web and print editions for the Journal Register Company‘s 18 daily newspapers might not appear terribly different from any other day’s. That was part of the point of the rapidly-reinventing-itself chain’s bold Ben Franklin Project. JRC wanted to prove that free does not necessarily mean cheap, that free or near-free online tools can achieve the same production values as pricey proprietary software. Take a closer look at the papers’ digital and print Ben Franklin Project editions, published on Independence Day to signify the company’s independence from proprietary systems, and you’ll notice they are different. You’ll notice stories suggested and edited by audience members. You’ll notice crowdsourced solutions to community challenges. You’ll notice videos putting a fresh human face on persistent issues like immigration and unemployment. You’ll notice interactive maps pinpointing user-identified problems like risky roadways. 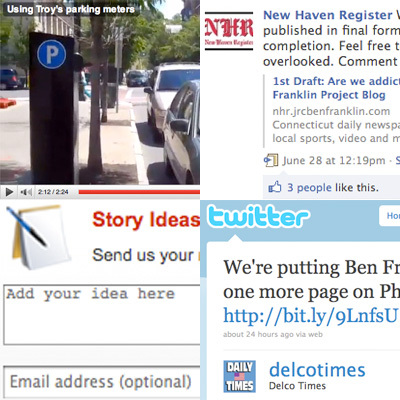 This was the Ben Franklin Project’s other, ultimately larger point: That free tools can improve both journalists’ coverage and their relationship with their audience by making the news process more participatory. That the papers — some with circulations as small as 6,000 — even attempted this ambitious project is groundbreaking for their famously slow-to-adapt industry. That they pulled it off is a remarkable feat. The executive behind this and other innovations at JRC — including citizen journalism labs and in-house testing of the latest tech tools — was rightfully celebratory in a blog post to employees this morning, exclaiming, “Take a bow. You did it.” CEO John Paton also rightfully recognized that this is only the beginning. The success or failure of an initiative characterized — by organizers and observers — as revolutionary can be judged only over the long-term. Merely sustaining the type of work showcased today will require more hard work, especially as the novelty — for employees and audience members — wears off. Building up the Ben Franklin Project into what the journalism history books (history tablets?) would consider a revolution will require a lot more hard work. It will require a firm technical and strategic grasp of the tools used to produce today’s editions. Employees, who had just over a month to learn many of the free tools they used, are by their own admission still getting the hang of pagination program Scribus. Microblogging service Twitter, meanwhile, is of greatest value to news organizations when they use it to converse with audience members and sources (two-way/pull/new-media thinking), yet many JRC papers use their Twitter feeds only to push out links to their stories (one-way/push/old-media thinking). It will require abandoning these tools at the drop of a hat and learning new ones as better alternatives come along. It will require engaging audience members — meeting them on the platforms they’re already using or educating them about the platforms they should be using — to the point they don’t have to be persuaded to participate. It will require not letting the new way of doing things disrupt what was right about the old way. As empowering as they are, interactive tools are a complement to thorough, old-fashioned, shoe-leather reporting, not a replacement for it. More than anything, it will require a bottom-up embrace of the digital-first, innovation culture Paton is evangelizing. No print-versus-Web, us-versus-them, that’s-not-part-of-my job whining. The Daily Freeman of Kingston, N.Y., asked social media users and passers-by what they thought the city should do with a condemned motel, broadening the official discussion ahead of a public brainstorming session. The Daily Local News of Chester County, Pa., on one of the nation’s higher-risk days for drunken driving incidents, shared online comments from victims and offenders and their families on how drunken driving has affected their lives. The Daily Tribune (whose BFP site appears to be empty — please advise if it’s located elsewhere) of Royal Oak, Mich., conducted an e-mail/snail mail/Twitter survey to determine its audience’s “Great Sports Hero.” The winner? “Mr. Tiger” Al Kaline. The Delaware County (Pa.) Times live blogged the production of its Ben Franklin Project paper and website, complete with behind-the-scenes videos. The Mercury of Pottstown, Pa., followed up on a road-rage-related shooting by mapping the spots users consider most prone to road-rage incidents. The Middletown (Conn.) Press was among the papers to share first drafts of stories with audience members ahead of final publication. Here’s the early version of its story on the cancellation of a municipal fireworks display. Here’s the final version. The Morning Journal of Lorain, Ohio, shared community reaction to a Wal-Mart store under construction on the west side of the city. The Morning Sun (whose BFP site I couldn’t locate — please advise if you find a link) of Mount Pleasant, Mich., offered its audience a detailed explanation of the Ben Franklin Project — via text and video — in a post by its executive editor. The New Haven (Conn.) Register, appropriately, surveyed its Facebook fans, Twitter followers and others about the future of the news media, receiving thoughtful responses instructive for it and its audience as they respond to each other’s changing habits in these transitional times. The News-Herald of Willoughby, Ohio — one of two papers to pilot the Ben Franklin Project last spring (the other was weekly Montgomery (County, Pa.) Media) — probably had a little too much fun producing its video promoting its favorite-hot-dog-condiment contest. Proving new media are changing more than just the news industry, it also published a multimedia piece — including a chat on its regular site — on funeral webcasts. The Oakland (County, Mich.) Press explored perceptions of bias in history textbooks. The topic was recommended by attendees at a town hall forum organized by the newspaper who probably weren’t even thinking about the Independence Day news peg. The Oneida (N.Y.) Dispatch, among the many publications to run editor’s notes on the project, explained how it’s “us[ing] new tools to achieve traditional goals.” It supported the column with an about-the-project video narrated by JRC Director of Digital Content Jonathan Cooper. The Register Citizen of Torrington, Conn., published a series of articles examining downtown revitalization. “A Common Vision” was based on Web comments, reader submissions and surveys. The Reporter of Landsdale, Pa., published video resumes to put a human face on the area’s worst unemployment and underemployment in more than a quarter century. The Saratogian of Saratoga Springs, N.Y., like The News-Herald, took a look at how another industry — in this case, the nonprofit sector — is leveraging new media. The Times Herald of Philadelphia suburb Norristown, Pa., combined man-on-the-street interviews, website, Twitter, Facebook and e-mail queries and an interactive poll attached to the resulting story in effort to determine who makes the area’s best cheesesteak. The Troy (N.Y.) Record shared some of users’ favorite vacation photos, many of them breathtaking. Also, on its regular home page, it gave prominent play to some of the JRC papers’ simplest, but most substantive, ongoing interactive features, letting users suggest stories, correct factual errors or report neighborhood problems in a single click. This entry was posted on	July 4, 2010 at 11:51 pm	and is filed under Uncategorized. Thank you for taking the time to examine the full scope of this project. From my vantage point as a former JRC editor and news director, and now publisher of a small daily, this single project did more to change the culture of this company from the bottom up than years of training workshops, policy statements and focus groups could have.